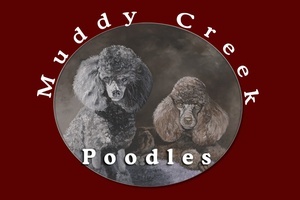 Muddy Creek Poodles is an ethical, responsible breeder of quality purebred, registered poodle puppies. Our dogs all are registered with AKC and all are tested and found to be “normal/clear” for PRA. I strive for Honest representation of size, color, health, temperament and pedigree of all my Poodle Puppies. My poodles have AKC and/or Russian Champion bloodlines. Selectively bred to produce puppies with excellent health, temperment and show stopping beauty!